Fleas are most often seen during the warmer months but as we keep our homes nice and warm throughout winter, we see fleas all year round. Only a small part of the adult flea population actually lives on your pet. All of the adult fleas are on the pet & the the eggs, larvae and pupae are in the enviorment and can survive for up to a year or longer. Treatment for more than a year would be needed to elimate the flea population in each household. It is important to not only treat your animal directly for fleas but also decontaminate the environment as well. Wash your pet’s bedding using the hottest cycle and regularly vacuum/clean carpets. We do not recommend flea collars or flea shampoos as you can’t guarantee it has been applicated over the whole animal and they fail to address the environmental flea infestation. 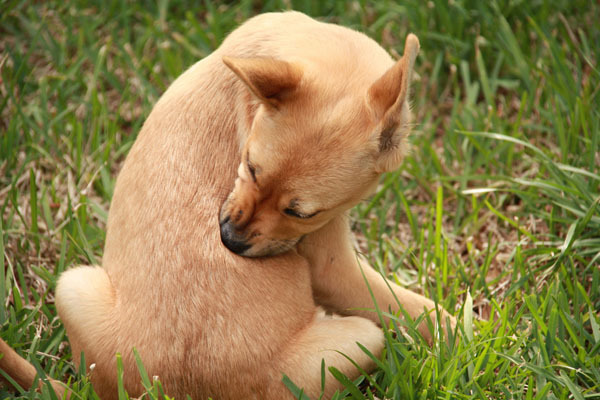 Fleas will tend to jump onto your pet only to feed and then jump off again. The flea, once hatched from the pupal stage (in repsone to vibrations and higher carbon dioxide levels of an animal nearby) stays on the animal first jumps ontot the whole time. Dogs and cats can have a reaction to flea saliva resulting in a skin condition called Flea Allergy Dermatitis or FAD. Treatment of FAD can be complicated and veterinary consultation is recommended. •It can be difficult to find the fleas, but is relatively easy to check for flea dirt. Simply moisten a cotton ball, part your pet’s fur and place the cotton ball on the skin over the rump. If the cotton ball takes on black specs surrounded by a reddish area, this may be flea dirt and can indicate that your pet has fleas. There is a number of flea treatment and control that is available within our veterinary clinic. We recommend spot on treatments or tablets that are available from reception. These are products that have been shown to kill adult and larval fleas within 20 minutes of contact. Most are safe for use on pregnant and lactating animals and can be used with other treatments under Veterinary advice. If you notice a tick on a pet that is not displaying signs of any tick you can remove the tick straight away or if you are not confident removing the tick please call us immediately to make an appointment to have it removed. It is better not to try and kill the tick first as the dying tick may inject more of its potent toxin into your pet. Once the tick is removed your pet should be kept cool and quiet whilst being closely monitored for 24 hours because signs can develop or pregress for some time after tick removal. If your pet starts to display any signs of tick paralysis, such as vomiting, weakness, staggering, breathing difficulty, or altered bark, seek immediate veterinary attention as this is a genuine veterinary emergency. If your pet is showing any of the above signs, do not offer food or water as these may be accidentally inhaled in tick-affected dogs. Tick preventatives are recommended if you are going to paralysis tick areas, and are ideally applied prior to going there to allow the product to disperese completly before you get to the at risk area.